Christina is a joyful, enthusiastic and playful 10 year old. She loves school, reading and playing her Disney Infinity. She loves the dirt, baking cookies and going out for frozen yogurt. Her least favorite chore is unloading the dishwasher so she has made it interesting by throwing the dishes into the drawers. She calls this game “shoots and scores”. We have a lot of plastic dishes! When we were expecting Christina, we knew that we would have a second child with Mitochondrial Disease at our 20 week ultrasound. Her disease manifests itself much like her older brother Jim’s with both neurological and developmental delays. Her neurological presentation is a bit better than her brother’s because we were able to introduce her to the mito vitamin cocktail and treatment much earlier in her development. Like her brother, Christina is very people oriented. They are both in Transition (special ed) programs at their schools in the Lake Washington School District. This summer Christina attended a music day camp where her favorite instrument was the glockenspiel. She learned how to play the bells to Bob Marley’s Three Little Birds, a song we sing a lot at home. She takes drum lessons, and when she is angry she tends to scream and hit, so we often send her to the drum kit to bang out her frustration. Christina started going to Camp Korey 3 years ago. I was scared to death to send her because she is developmentally delayed and was developmentally about a 4 year old. But she has had the most loving, giving counselors, staff and nurses who all worked so hard to make the week exciting and fun for her. 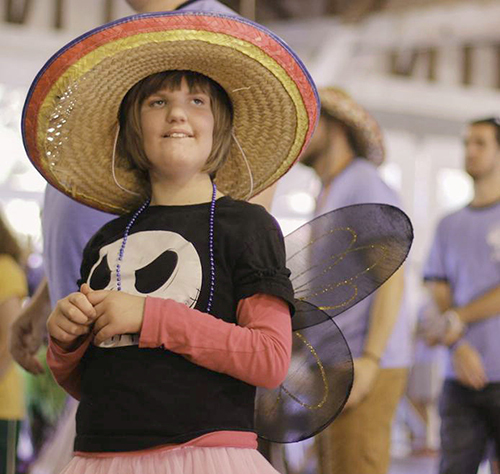 Her favorite thing to do at Camp Korey is to play dress up and to dance. She also loves the canoes and riding horses. I feel like the biggest thing Camp Korey has given her is courage to try new things. She comes home so happy, standing 2 inches taller, is more independent and so excited to go again. Her counselors and staff always have so many great stories to share. In the last 2 years, we have tried to make an effort to take the time that Christina and her brother are away at camp to be more engaged with one another as a couple and to do something fun together. For us as parents of special needs kids, Camp has meant one week of renewal and reconnection that we didn’t even know we desperately needed. We have been able to connect with parents of other children with the same condition when we felt alone and isolated by the situation we were in. But raising Christina and her brother has taught us a great deal. We have learned so much in these years, about faith, fun, “yes”, and how important it is to wear fairy wings once in a while!